Opabinia made a big contribution to interest in the Cambrian explosion. The Cambrian explosion is when many animal phyla first appeared in the fossil record. It happened 541 million years ago (mya). Probably most had evolved before then, but that was their first appearance as fossils. Before about 580 mya it seems that most organisms were simple. They were made of individual cells, occasionally organized into colonies. Over the following 70 or 80 million years the rate of evolution seemed to accelerate. By the end of the Cambrian most phyla we know today existed. The Cambrian explosion has caused much scientific debate. The seemingly rapid appearance of fossils in the 'primordial strata' was noted as early as the mid 19th century, and Charles Darwin saw it as one of the main objections that could be made against his theory of evolution by natural selection. whether it actually happened. Was there really was a mass diversification of complex organisms over a relatively short period of time during the early Cambrian? what might have caused such rapid change. what it might say about the origin and evolution of animals. Understanding it is difficult because the supply of evidence is limited. 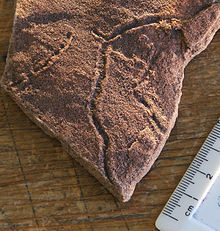 The evidence is an incomplete fossil record, and chemical signatures left in Cambrian rocks. 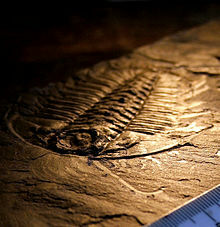 The Cambrian explosion is the classic example of megaevolution. By that is not meant a different kind of evolution; rather, it means evolution which produces a tremendous effect. The word 'macroevolution' is used because the changes were really huge. 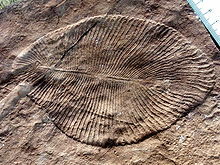 The Cambrian explosion started in the Ediacaran from about 575 mya, and continued to the Burgess Shale at about 507 mya. That is about 70 million years. By the end all modern phyla had evolved, and since then no new phyla have appeared in the fossil record. This is one of the things that need to be explained. Stromatolites (Pika Formation, Middle Cambrian) near Helen Lake, Banff National Park, Canada. Modern stromatolites in Hamelin Pool Marine Nature Reserve, Western Australia. Stromatolites, stubby pillars built by colonies of cyanobacteria and other microorganisms, are the first fossils. Their record starts about 3.5 billion years ago, and they were very common from about 2700 mya. They declined steeply after about 1250 mya, and this decline was probably caused by grazing and burrowing animals. Precambrian marine diversity was dominated by small fossils known as acritarchs. This term describes almost any small organic walled fossil—from the egg cases of small metazoans to resting cysts of many different kinds of green algae. After appearing around 2000 mya, acritarchs had a boom around 1000 mya, increasing in number, diversity, size, complexity of shape and especially size and number of spines. Their increasingly spiny forms in the last billion years may indicate an increased need for defence against predation. Other groups of small organisms from the Neoproterozoic era also show signs of anti-predator defences. Measuring taxon longevity  seems to show an increase in predation around this time. However, in general, the rate of evolution in the Precambrian was very slow, with many cyanobacterial species lasting unchanged for billions of years. Of course, bacteria are defined mainly by their biochemistry, especially their genomes. Changes in their biochemistry would usually leave no trace in the fossil record. If the predatory organisms which grazed on bacteria and acritarchs really were metazoans, this means that Cambrian animals did not appear "from nowhere" at the base of the Cambrian; their ancestors had existed for hundreds of millions of years. Gould S.J. 1989. Wonderful life: the Burgess Shale and the nature of history. W.W. Norton & Company. Conway Morris S. 1997. The crucible of creation: the Burgess Shale and the rise of animals. Oxford University Press. ISBN 0-19-286202-2. Conway Morris, S. (2006). "Darwin’s dilemma: the realities of the Cambrian ‘explosion’". Philosophical Transactions of the Royal Society B: Biological Sciences 361 (1470): 1069–1083. doi:10.1098/rstb.2006.1846. ISSN 0962-8436. PMC 1578734. PMID 16754615. ↑ Butterfield N.J. (2001). "Ecology and evolution of Cambrian plankton". The ecology of the Cambrian radiation (PDF). Columbia University Press, New York. pp. 200–216. ISBN 9780231106139. Retrieved 2007-08-19. ↑ Bambach R.K.; Bush A.M. & Erwin D.H. (2007). "Autecology and the filling of ecospace: key metazoan radiations". Palæontology 50 (1): 1–22. doi:10.1111/j.1475-4983.2006.00611.x. ↑ 5.0 5.1 5.2 Butterfield N.J. 2007. Macroevolution and macroecology through deep time. Palaeontology 50 (1): 41. doi:10.1111/j.1475-4983.2006.00613.x. ↑ Buckland, W. (1841). Geology and mineralogy considered with reference to natural theology. Lea & Blanchard. ISBN 1147868948. ↑ Darwin, (1859). On the origin of species by natural selection. Murray, London, United Kingdom. pp. 315–31. ISBN 1602061440. OCLC 176630493. ↑ McNamara K.J. (1996). "Dating the origin of animals". Science 274 (5295): 1993–1997. doi:10.1126/science.274.5295.1993f. http://www.sciencemag.org/cgi/content/full/274/5295/1993f. Retrieved 2008-06-28. ↑ Awramik S.M. (1971). "Precambrian columnar stromatolite diversity: Reflection of metazoan appearance" (abstract). Science 174 (4011): 825–827. doi:10.1126/science.174.4011.825. PMID 17759393. http://www.sciencemag.org/cgi/content/abstract/174/4011/825. Retrieved 2007-12-01. ↑ Stanley (2008). "Predation defeats competition on the seafloor" (extract). Paleobiology 34 (1): 1. doi:10.1666/07026.1. http://paleobiol.geoscienceworld.org/cgi/content/extract/34/1/1. This page was last changed on 7 February 2019, at 02:03.